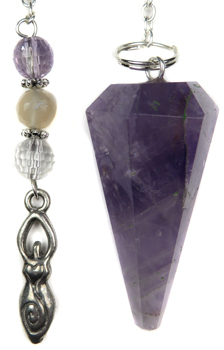 A faceted Amethyst pendulum adorned with faceted Amethyst, Moonstone and clear Quartz beads, pewter daisy spacers and a small pewter goddess charm. Comes with a velveteen pouch. Moonstone: A stone for “new beginnings”, Moonstone is a stone of inner growth and strength. Soothes emotional instability and stress, and stabilizes the emotions, providing calmness. Enhances intuition, promotes inspiration, success and good fortune in love and business matters. Said to be excellent for PMS, conception, pregnancy, childbirth, and breast-feeding. Moonstone is also beneficial to men in opening the emotional self. Chakra(s): Third Eye, Solar Plexus.